Eventhough IDERI note does not offer a timer to automatically resend messages at a certain time, this can be done with simple windows tools. 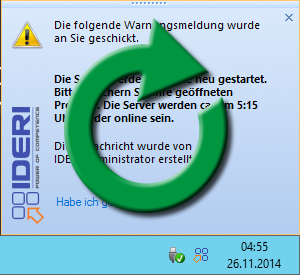 Let’s assume that every day at 5 o’clock we perform a restart of our servers. But since we have a small field office abroad, as well as some nocturnal employees or even colleagues working night shift in the company, who access some of the servers, we want to inform them now briefly with IDERI note about the upcoming restart of the server. For the implementation, you only need a computer that is still running at this time, so preferably a Windows server, as well as the IDERI note Commandline Tools.